An expanding wild symbol on reel three. If you’re new to the world of online slots the terminology involved can be a little baffling, even if you’re familiar with physical slots or fruit machines. 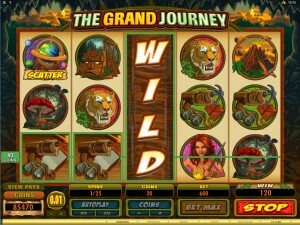 Even those who play three reel slots or arcade slots online can often be left scratching their heads when they move on to the more complex five reel versions. the more parochial aspects of the technology. In this article we’re going to talk about the ‘wild’ symbols, what they are and how they can enhance your winning possibilities. Without exception every single five reel slot machine will have a wild symbol, whoever the manufacturer is. The basic function of a wild symbol is to substitute for other symbols on the reels to create a winning combo, although there are some exceptions. So for example if you have two Aces in a row on a payline, a wild symbol in the third position on the payline will create the winning combo. Definitely worth a mention; this is a wild symbol that stretches to cover all the symbols on it’s reel, usually if it’s involved in a winning combo. Expanding wilds often contain a nice animation related to the game’s theme. If your game features stacked wilds it means that they will appear above and below each other on a reel, essentially providing the same extra winning options as an expanding wild. We mentioned above that there are some exceptions to which symbols can be substituted by a wild and in general it’s the special ones such as scatter symbols and bonus game symbols which won’t be swappable. So that’s wild symbol – simple but useful and hopefully lucrative!